Érdeklődj és rendeld meg tanácsadóinktól! 2019. május 21. 2019. május 31. 2019. május 23. 2019. június 2. 2019. június 5. 2019. június 15. 2019. június 9. 2019. június 19. 2019. június 11. 2019. június 21. 2019. június 20. 2019. június 30. 2019. július 2. 2019. július 12. 2019. július 7. 2019. július 17. 2019. július 18. 2019. július 28. 2019. július 23. 2019. augusztus 2. In the afternoon, opt to walk in the footsteps of the King of Rock ‘n’ Roll at Elvis Presley’s home, Graceland. See how the legend lived and discover videos, pictures, stage costumes, and much more. 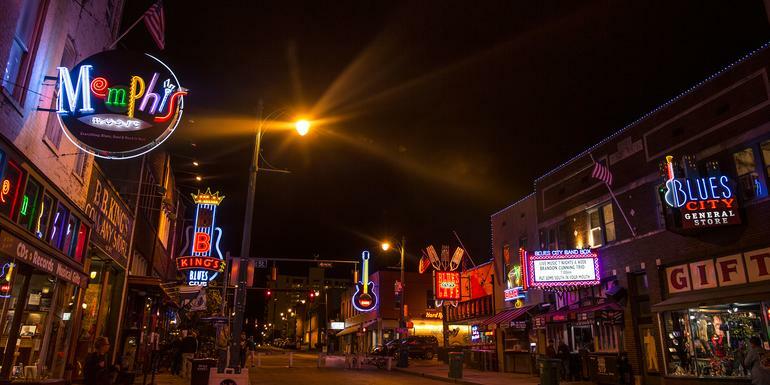 Then hear the music in Memphis, Tennessee! 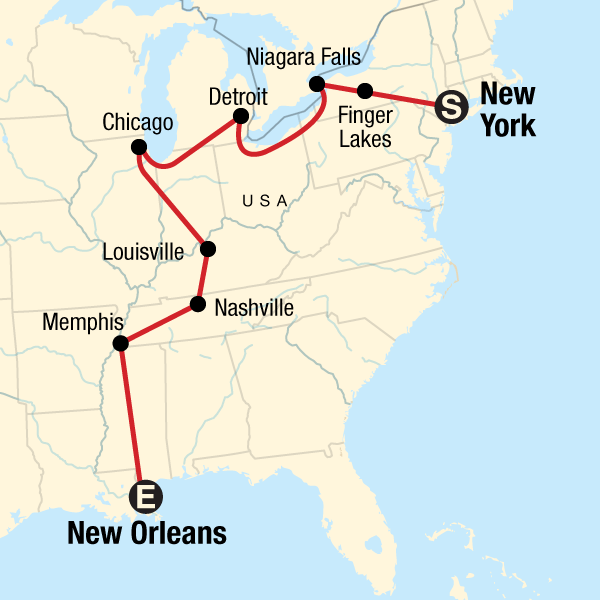 Explore the birthplace of Rock 'n' Roll, Home of Blues, and the starting point of soul. Music legends, including Elvis Presley, Johnny Cash, and B.B. King, made their marks on Memphis. Your Discover Moment: Chicago. Taughannock Falls visit. Maid of the Mist tour. Cleveland stop. Free time in Detroit, Chicago, Louisville, Nashville, and Memphis. Self-inflating mattresses and dome tents while camping. All transport between destinations and to/from included activities. 1. An essential part of your trip is participation - from putting up your tent (while camping) or packing it away in the morning, to helping with meal preparation and cleaning up - it is all part of your adventure and when everyone puts in a little effort the trip will run smoothly. Your CEO will do all the meal planning, but we do ask the clients to help with the preparation and washing up. Team spirit is part of the fun! All camping equipment (with the exception of your sleeping bag and pillow) is supplied. We supply dome tents and assembly/disassembly takes only 5 minutes. All tents have built-in insect nets. Comfortable, self-inflating mattresses are also provided, which are approximately 4cm thick. 2. Proper sleeping bags are necessary for this tour. Evening temperatures can reach -9°C - 0°C. Please ensure that your sleeping bag is rated to (-17°C for spring and fall trips and 0°C for trips June - Sept). If you prefer you can purchase a proper sleeping bag on the first day of the trip. Prices range from $60-$150USD. 7. Please note that the legal drinking age in the United States is 21 and in Canada, 19 (with Alberta and Quebec at 18). Many bars and clubs will ask for ID at the door, therefore listening to live music in certain bars or spending a night out in Las Vegas or New Orleans is not possible when you are under the legal age, even if you don't plan on consuming alcohol. Drinking laws in both countries are strictly enforced and our CEOs are unable to help those under age obtain alcohol of any kind. This G Adventures group trip is accompanied by one of our group leaders, otherwise known as a Chief Experience Officer (CEO). The CEO will be the group manager, leader and sometimes the driver - this person is knowledgeable in the routes travelled and will organize and lead the meal preparations and has experience in cooking a variety of local and international dishes for large groups. Taxi/Ride App - The easiest way to get to your hotel is to get a taxi. Rates range from $60-$85 depending on traffic. Can have additional surcharge for 2+ travelers. Public Transport - From the arrivals hall take the AirTrain JFK Red Line to Jamaica Station. Transfer to the Far Rockaway, Hempstead or City Zone Lines to Atlantic Terminal. Transfer to the R (Bay Ridge - 95 St) Line and travel 4 stops. Exit at 25th St and walk about 5 minutes to the hotel. Taxi/Ride App - The easiest way to get to your hotel is to get a taxi. Taxi rates to your destination can range from $60-$75 (does not include tolls and tip) for a single traveler. Can have additional surcharge for 2+ travelers. Bus/Subway - The Newark Airport Express departs from all arrival terminals. The fare is $16 and the bus will take you to the Port Authority Bus Terminal. From here walk about 5 min to transfer to the R (Bay Ridge - 95 St) Line at Times Sq-42 St Station. Take it 19 stops and get off at 25th St. From this stop the Hotel is a 5 minute walk. Taxi/Ride App - The easiest way to get to your hotel is to get a taxi. Taxi rates to your destination can range from $50-$75 (does not include tolls and tip) for a single traveler. Can have additional surcharge for 2+ travelers. Bus - From the arrivals hall take the Q70-SBS+LaGuardia Link Select Bus Service to Roosevelt Av/74 St. Transfer to the R (Bay Ridge - 95 St) Line take it 30 stops and get off at the 25th St stop. From this stop the Hotel is a 5 minute walk. Camping: • Hiking boots/sturdy walking shoes • Sleeping bag and liner, 4 season • Socks • Thermal base layer • Travel pillow • Windproof rain gear Cold Weather: • Long-sleeved shirts or sweater • Scarf • Warm gloves • Warm hat • Warm layers Documents: • Flight info (required) (Printouts of e-tickets may be required at the border) • Insurance info (required) (With photocopies) • Passport (required) (With photocopies) • Required visas or vaccination certificates (required) (With photocopies) • Vouchers and pre-departure information (required) Essentials: • Binoculars (optional) • Camera (With extra memory cards and batteries) • Cash, credit and debit cards • Day pack (Used for daily excursions or short overnights) • Ear plugs • First-aid kit (should contain lip balm with sunscreen, sunscreen, whistle, Aspirin, Ibuprofen, bandaids/plasters, tape, anti-histamines, antibacterial gel/wipes, antiseptic cream, Imodium or similar tablets for mild cases of diarrhea, rehydration powder, water purification tablets or drops, insect repellent, sewing kit, extra prescription drugs you may be taking) • Flashlight/torch (Headlamps are ideal) • Fleece top/sweater • Footwear • Hat • Locks for bags • Long pants/jeans • Moneybelt • Outlet adapter • Personal entertainment (Reading and writing materials, cards, music player, etc.) • Reusable water bottle • Shirts/t-shirts • Sleepwear • Small travel towel • Sunglasses • Toiletries (Preferably biodegradable) • Watch and alarm clock • Waterproof backpack cover • Windproof rain jacket Warm Weather: • Sandals/flip-flops • Shorts/skirts (Longer shorts/skirts are recommended) • Sun hat/bandana • Swimwear Note: For evenings out in some cities there will be a dress code. If you wish to participate, please bring a nicer outfit for these occasions. We recommend a nicer pair of shoes and a collared shirt or blouse.